School of Oracles offers both readings and classes in Tarot, Palmistry and Astrology. My name is Ellen Goldberg and I am the founder and director of this modern mystery school. I am both a psychotherapist and a mystic, with over 45 years of reading experience. I welcome you and invite you to navigate this site and explore the various pages that seem of interest. The journey of life is both wondrous and difficult. But we do not have to go it alone. There are signposts all along the way to guide us. These mystical sciences are some of the best tools for assistance that life has given us. A reading can offer you a deeper understanding of yourself and your life. It shows you the lessons your soul took birth to learn, your karma, obstacles, your talents and your options. There is never only one way. A reading opens up the places where you have been stuck, confused or troubled. A reading can offer you ways to become self realized, to increase inner peace and find satisfaction in a manner that is in accord with your authentic nature. A reading reveals your Self to yourself. 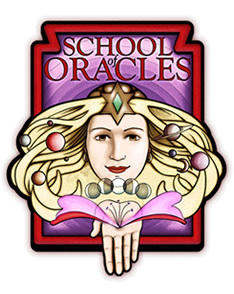 Whether you are interested in a personal reading to guide you at this moment in your life, or wish to learn to become a skilled reader for yourself and others, the School of Oracles can be of benefit to you.